I am privileged to belong to The Stone Club. Led by Carole Stone, former producer of BBC’s flagship Question Time. The Stone Club is a meeting place for minds, connecting businesses, social enterprises, entrepreneurs, media and politics. During my time attending The Stone Club, I have met Professor Charles Handy, Michael Buerk, the entrepreneur Lara Morgan, senior executives for Fortune 500 companies and quite a few less famous but equally phenomenal people. I first met Carole many years ago where we shared a stage at Pfizer alongside John Otway. Carole’s last networking event had an extremely engaging presentation and dialogue on the art of empathic conversation in a complex and changing world. This session was jointly presented by Oman Krznaric, writer, cultural thinker & Co-Founder of The School of Life, and Karl James, Director of The Dialogue Project. One of the phenomenal people I connected with at this event was Andrea Ehrenberg who offers live graphic facilitation. Here is the rich picture / word collage that she produced live during the conversation in front of about 70 people. An amazing feat. Although I am an expert mind mapper, Andrea combines systemic and creative thinking with a more artistic approach than my own fair hands are capable of. 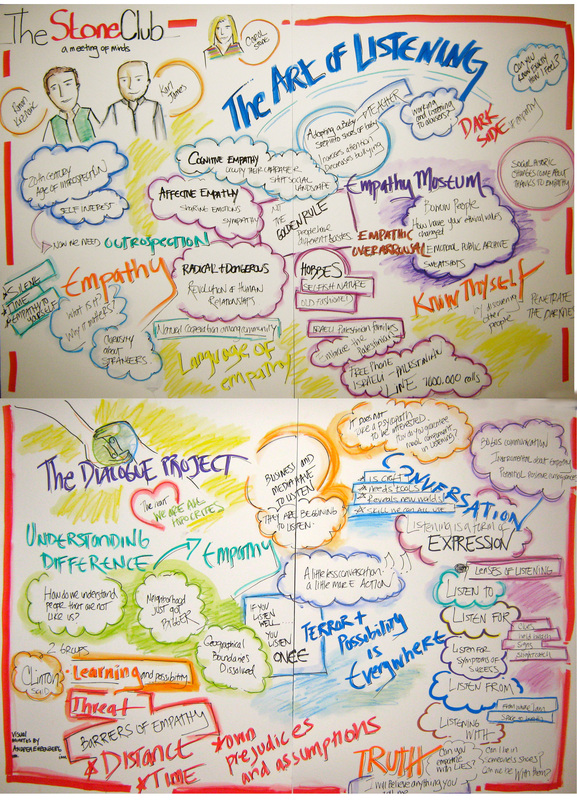 Check her work out for your next live graphic facilitation event. For me, the hallmark of a great networking event is great company, the kind of learning that leaves you with as many new questions as answers, plus a superb social element to the event. Carole Stone does it all with swan like grace. Here are some of the questions we explored. Feel free to post your thoughts here. To what extent does an oversupply of Emotional Intelligence and empathy drive out the ability for business leaders to make tough decisions and lead change? Can empathy be taught? If so, are children naturally inclined to be empathetic but it is drilled out of them as they get older? If that is true, do we need more empathy lessons for adults rather than thinking it needs to be taught to kids? Is empathy a critical skill and more important than negotiation when dealing with critical conflict situations, such as the ones described in war zones? When is empathy a more powerful ‘soft’ skill than ‘hard’ skills such as direction, selling, negotiation and so on?